Abstract. Transepithelial transport of retinol is linked to retinol-binding protein (RBP), which is taken up and also synthesized in a number of epithelia. By immunocytochemistry of human, rat, and mouse renal proximal tubules, a strong staining in apical endocytic vacuoles, lysosomes, endoplasmic reticulum, Golgi, and basal vesicles was observed, in accordance with luminal endocytic uptake as well as a constitutive synthesis and basal secretion of RBP. Analysis of mice with target disruption of the gene for the major endocytic receptor of proximal tubules, megalin, revealed no RBP in proximal tubules of these mice. Western blotting and HPLC of the urine of the megalin-deficient mice instead revealed a highly increased urinary excretion of RBP and retinol, demonstrating that glomerular filtered RBP-retinol of megalin-deficient mice escapes uptake by proximal tubules. A direct megalin-mediated uptake of purified RBP-retinol was indicated by surface plasmon resonance analysis and uptake in immortalized rat yolk sac cells. Uptake was partially inhibited by a polyclonal megalin antibody and the receptor-associated protein. The present data show that the absence of RBP-binding megalin causes a significantly increased loss of RBP and retinol in the urine, demonstrating a crucial role of megalin in vitamin A homeostasis. Retinol-binding protein (RBP1) is a 21-kD plasma protein and the main carrier of vitamin A (retinol) in plasma. Retinol is coupled to RBP in the liver and the complex is circulating in plasma bound to transthyretin (TTR), previously named prealbumin, which to a certain extent prevents the RBP-retinol complex from being filtered in the glomeruli. However, 4 to 5% of the circulating RBP-retinol complex is not bound to TTR (1), and the kidney appears to be a very important organ in the recycling of RBP-retinol, contributing about 50% of the total circulating pool of RBP-retinol as estimated in rat (2). In accordance with this, RBP has been intensively used clinically to determine proteinurias of tubular origin (3,4), further indicating that RBP is filtered to a major extent in the renal glomeruli and taken up in proximal tubules as confirmed by immunohistochemistry (5,6). The role of the kidney in retinol homeostasis is also substantiated by the finding that acute renal failure induces significant elevations of serum retinol concentrations (7,8). Furthermore, RBP mRNA has been detected in rat kidney by in situ hybridization (9), and it is suggested that retinol subsequent to tubular uptake is being returned to the circulation again in complex with RBP. Because RBP is taken up in proximal tubules, and retinol stimulates the expression of megalin in a rat kidney proximal tubule cell line (10), we investigated if this highly expressed receptor in proximal tubules might mediate uptake of RBP. Megalin, a 600-kD protein localized in the endocytic pathway of renal proximal tubules (11), belongs to the LDL receptor family (12,13,14). The protein functions as an endocytic receptor for a wide variety of substances, including lipoproteins (15,16,17,18), albumin (19), and basic drugs (20) (reviewed in reference (21)). In addition, megalin binds calcium and receptor-associated protein (RAP), a chaperone-like protein (22). Interestingly, megalin also functions as a receptor for endocytic uptake of the two vitamin carrier proteins, vitamin B12-carrier transco-balamin (23) and vitamin D-binding protein (A. Nykjær, D. Dragun, D. Walther, et al., Cell 1999, in press). These findings demonstrate that megalin is fundamental for the retainment of substances vital for the organism. The general importance of megalin is supported by the findings that knockout of the megalin gene in mice results in a high mortality and developmental abnormalities (24). The present study was carried out to investigate the importance of megalin for renal proximal tubular reabsorption and synthesis of RBP, which is suggested to control the transepithelial transport of retinol. Using different approaches including immunocytochemistry and urine analyses of megalin-deficient mice and normal control animals, ligand uptake studies in megalin-expressing cells, and ligand binding to purified megalin, we now evidence a key function of megalin in this process. RBP was purified from human plasma from Blodbanken, Ullevål sykehus, Oslo, Norway. Plasma was first dialyzed against 0.05 M NaH2PO4 containing 0.05 M NaCl, pH 7.5, to separate RBP-retinol from TTR at low ionic strength. The dialyzed plasma was then loaded onto a diethylaminoethyl-Sepharose Fast Flow column (Pharmacia, Uppsala, Sweden) and eluted by a NaCl gradient, 0.05 to 0.6 M using an fast protein liquid chromatography (Pharmacia). The fractions absorbing at 313 nm containing RBP were collected, pooled, and submitted to gel filtration in phosphate-buffered saline on a Superdex 200 preparative column using the fast protein liquid chromatography. The fractions absorbing at 313 nm were pooled and loaded onto a TTR (purchased from Scigen, Kent, United Kingdom)-coupled Sepharose at 140 mM NaCl and eluted at low ionic strength in water buffered with NH3, pH 10, as described (25). Purified RBP was then analyzed by sodium dodecyl sulfate-polyacrylamide gel electrophoresis, together with known amounts of commercially available RBP (Sigma, St. Louis, MO). The gel was stained with Coomassie R-250, and the concentration of purified RBP was estimated visually by the intensity of the bands. RBP was stored frozen at -20°C. A rabbit polyclonal antihuman RBP antibody and a rabbit polyclonal antihuman cathepsin D antibody were obtained from Dako (Dako A/S, Glostrup, Denmark), mouse monoclonal antihuman RBP was from Transduction Laboratories (Lexington, KY), and rat monoclonal anti-mouse LAMP2 against lysosome-associated membrane protein was a kind gift from Dr. Ira Mellman (Department of Cell Biology, Yale University School of Medicine, New Haven, CT). Normal, uninvolved human renal tissue was obtained from resected renal carcinoma kidneys and fixed in 8% paraformaldehyde in 0.1 M sodium cacodylate buffer, pH 7.2. Mouse megalin knockout and control kidneys were fixed by perfusion through the heart with 4% paraformaldehyde in the same buffer, and rat kidneys were fixed by retrograde perfusion through the abdominal aorta with 1 or 4% paraformaldehyde. The tissue was trimmed into small blocks, further fixed by immersion for 1 h in 1% paraformaldehyde, infiltrated with 2.3 M sucrose containing 2% paraformaldehyde for 30 min, and frozen in liquid nitrogen. For some electron microscope immunocytochemical experiments, tissue treated and frozen as above was further freeze-substituted in a Reichert AFS (Reichert, Vienna, Austria) as follows: 3 d in methanol containing 0.5% uranyl acetate at -80°C, washed in methanol for 2 d increasing the temperature gradually to -45°C, gradually infiltrated over 2 d with Lowicryl HM20 (Polysciences, Waldkraiburg, Germany) and methanol 1:2, 1:1, and finally pure Lowicryl HM20, and then polymerized by ultraviolet polymerization at -45°C for 2 d and at 0°C for 2 d as described previously (26). For light microscopy, 0.8-μm cryosections were obtained at -80°C, and for electron microscopy ultrathin (70 to 90 nm) sections were obtained at -100°C with an FCS Reichert Ultracut S cryoultra-microtome as described previously (22). Ultrathin (400 to 600 nm) sections were obtained from the cryosubstituted tissue with a Reichert Ultracut E ultramicrotome. For immunolabeling, the sections were incubated with primary polyclonal anti-RBP diluted 1:800 to 1:4000 or monoclonal anti-RBP (1 to 10 μg/ml) either at room temperature for 1 h or overnight at 4°C after preincubation in phosphate-buffered saline containing 0.05 M glycine and 0.1% nonfat dry milk or 1% bovine serum albumin. For electron microscopic double labeling experiments, sections from human kidneys were incubated with monoclonal anti-RBP together with rabbit anti-cathepsin D, 1:5000 (cryosections) or 1:400 (HM20 embedded tissue). Sections from mouse kidneys were incubated with polyclonal anti-RBP together with rat monoclonal anti-LAMP2 diluted 1:10 to 1:100. For light microscopy, the sections were subsequently incubated with peroxidase-conjugated secondary antibodies (Dako), the peroxidase was visualized with diaminobenzidine, and the sections were subsequently counterstained with Meier's stain for 2 min and examined in a Leica DMR microscope (Wetzlar, Germany) equipped with a Sony 3CCD color video camera attached to a Sony Digital Still recorder. Images were processed using Adobe Photoshop 4.0 and printed on Kodak Ektotherm XLS paper with a Kodak ColorEase PS printer. For electron microscopy (after the primary antibody incubation), the sections were incubated with 5 or 10 nm goat anti-rabbit, goat anti-mouse, or goat anti-rat gold particles (BioCell, Cardiff, United Kingdom). The cryosections were embedded in 2% methylcellulose containing 0.3% uranyl acetate, and the sections from cryosubstituted tissue were stained with uranyl acetate for 10 min and studied in a Philips CM100 electron microscope. Sections were incubated with secondary antibodies alone or with nonspecific rabbit or mouse IgG. None of the controls showed any labeling. Mice genetically deficient for megalin were generated by targeted gene disruption as described previously (24). Most newborn knockout mice die from developmental defects primarily affecting the forebrain and the lung. However, approximately 1 out of 50 receptor-deficient animals survives to adulthood. These animals were used to study the consequence of the receptor defect for tubular function. For urine collection, mice were placed in metabolic cages for 16 h and given 10% sucrose in the drinking water. Urine samples obtained were qualitatively indistinguishable from samples collected without sucrose load. Urine volume per hour and creatinine levels were identical in megalin -/- and in control mice (data not shown). Urinary excretion of RBP was analyzed after subjecting the urine samples to 4 to 15% nonreducing sodium dodecyl sulfate-polyacrylamide gel electrophoresis. Samples were transferred to nitrocellulose filters and incubated with 5 μg/ml rabbit antihuman RBP antibody. Bound IgG was detected with the enhanced chemiluminescence system (ECL; Amersham). Urine collected from control mice and megalin-deficient mice was analyzed for retinol by HPLC as described by Gundersen et al. (25). Briefly, 40 μl of urine was extracted on-line on a solid-phase C18 column using a column switching system before the analytes bound to the pre-column were backflushed to the Suplex pKb-100 analytical column for separation and detected by ultraviolet absorption at 326 nm. The urine from control mice was spiked with retinol to confirm the identity of the retinol peak. For the surface plasmon resonance analyses, the BIAcore sensor chips (type CM5, Biosensor, Uppsala, Sweden) were activated with a 1:1 mixture of 0.2 M N-ethyl-N′-(3-dimethylaminopropyl) carbodiimide and 0.05 M N-hydroxysuccinimide in water according to the manufacturer's instructions. Rabbit renal megalin was immobilized as described (27). The surface plasmon resonance signal from immobilized rabbit megalin generated 15 to 21 × 103 BIAcore response units (RU) equivalent to 25 to 35 fmol/mm2. The flow cells were regenerated with 20 μl of 1.5 M glycine-HCl, pH 3.0. The flow buffer was 10 mM Hepes, 150 mM NaCl and 1.5 mM CaCl2 and 1 mM ethyleneglycol-bis(β-aminoethyl ether)-N,N′-tetra-acetic acid, pH 7.4. The binding data were analyzed using the BIAevaluation program. The number of ligands bound per immobilized receptor was estimated by dividing the ratio RUligand/Massligand with RUreceptor/Massreceptor. Megalin-expressing Brown Norway rat yolk sac epithelial cells transformed with mouse sarcoma virus (28) were grown to confluence (approximately 400,000 cells/well) in 24-well plates (Nunc A/S, Denmark) in minimum essential medium (Life Technologies, Paisley, United Kingdom) containing 10% fetal calf serum. RBP saturated with retinol was purified from human plasma as described. Iodination was performed by the chloramine-T method. The specific activity was approximately 1 MBq/μg. Incubation with 125I-RBP was carried out in minimum essential medium supplemented with 0.1% bovine serum albumin. Degradation of the proteins was measured by precipitation of the incubation medium in 12.5% TCA. Cell-associated radioactivity was measured by counting the cells after solubilization of the cell layer in 1% Triton X-100. Light microscope immunohistochemistry of rat and human proximal tubules revealed a strong granular staining for RBP of especially the early segments of the proximal tubule. 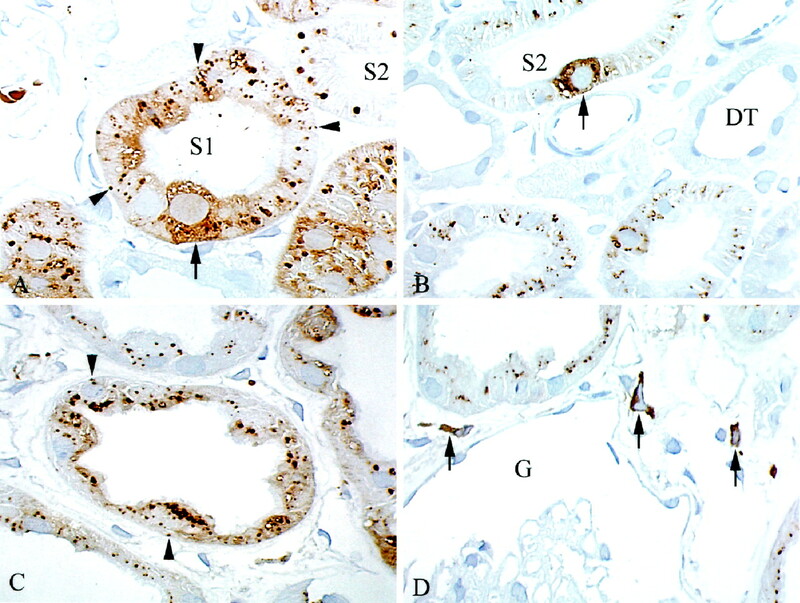 In some rats and in the three human kidneys studied, it also extended into segment 2 as seen in Figure 1, A through C. In two of the human kidneys, there was also a staining in segment 3 (not shown). 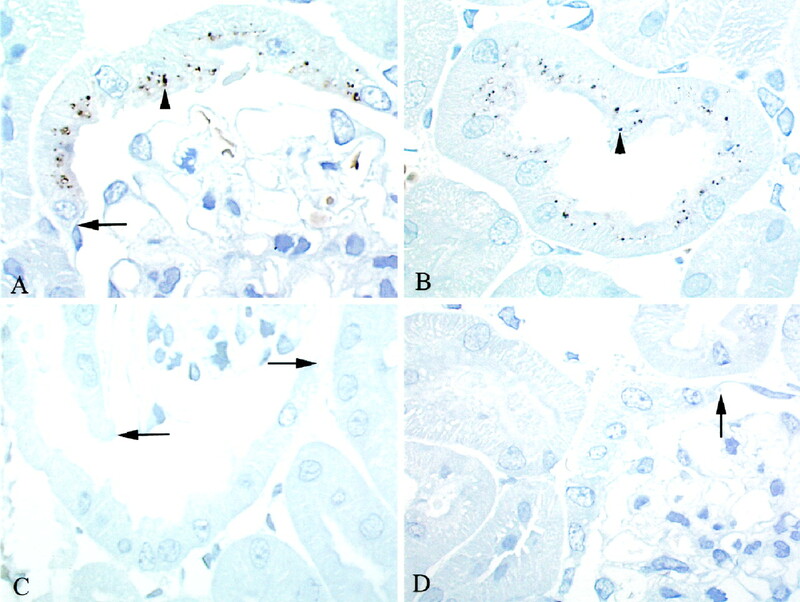 In addition to the granular staining corresponding to the location of endosomes and lysosomes, there was also, in both rat and human kidneys, a staining of small granules located close to the basement membrane (Figure 1, A and C). Furthermore, a distinct apparent cytoplasmic labeling was evident. This labeling was seen mainly in the early parts of the proximal tubule (Figure 1A), but also in occasional single cells further down in the proximal tubule (Figure 1B). In the human kidneys, there was a strong labeling of interstitial fibroblast-like cells in the cortex (Figure 1D) and outer zone of the outer medulla (not shown). Mice (Figure 2, A and B) showed a staining similar to that described in the rat, whereas no labeling for RBP was seen in five megalin-deficient mice analyzed (Figure 2C). Sections from control mice incubated without primary antibody (Figure 2D) showed no labeling. Immunohistochemical labeling of retinol-binding protein (RBP) in rat (A and B) and in human (C and D) renal cortex. (A) An intense labeling is seen in a cross-sectioned segment 1 (S1), including a granular and an apparent cytoplasmic labeling. One cell (arrow) shows a pronounced cytoplasmic labeling. In addition, these cells demonstrate labeling of several basal granules (arrowheads). A segment 2 proximal tubule (S2) shows only granular, probably lysosomal, labeling. (B) Granular labeling of segment 2 (S2) proximal tubules. One cell shows in addition intense cytoplasmic labeling (arrow). Distal tubule (DT) is unlabeled. (C) Section from human cortex demonstrates proximal tubules with intense granular labeling including basal granules (arrowheads) and varying cytoplasmic labeling. (D) Several interstitial fibroblast-like cells (arrows) exhibit an intense cytoplasmic labeling. Glomerulus (G) is unlabeled. Magnification: ×1000 in A and C; ×750 in B and D.
Immunohistochemical labeling for RBP in wild-type mice (A and B) and in megalin-deficient mouse (C). (A) Intense granular labeling (arrowhead) of initial part of proximal tubule; arrow points to transition from Bowman's capsule to proximal tubule epithelium. (B) Granular labeling of early proximal tubule (arrowhead); surrounding cross sections of proximal tubules are unlabeled. (C) Section from megalin-deficient mouse; no labeling is observed. Arrows indicate start of proximal tubule. (D) Section from wild-type mouse incubated without primary antibody shows no labeling. Arrow indicates start of proximal tubule. Magnification, ×1000. Electron microscope immunocytochemistry of cryosections from the three species revealed an intense labeling of endosomes and especially of lysosomes as shown in Figures 3,4,5 and verified by double labeling for cathepsin D in human (Figure 4) and LAMP2 in mice (Figure 5A). 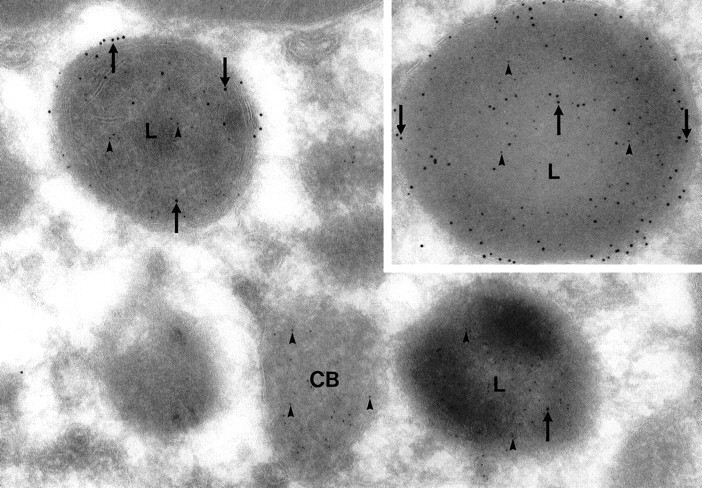 Basal cytoplasmic granules of all species were also labeled for RBP (Figures 3B), and double labeling for cathepsin D in human (Figure 4) and LAMP2 in mice (Figure 5, B and C) indicated that these vesicles were not lysosomes. 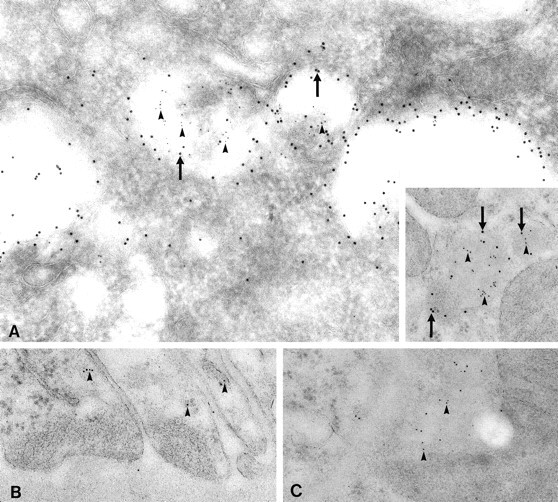 Furthermore, there appeared in these cells to be labeling of the granular endoplasmic reticulum and vesicles in the Golgi region for RBP (Figure 6). Altogether, these data suggest an apical endocytic uptake as well as synthesis and basolateral secretion of RBP. Electron microscope immunocytochemistry for RBP on rat proximal tubules from cryosubstituted tissue, using polyclonal anti-RBP and 10 nm gold. (A) Two intensely labeled lysosomes (L) are seen; mitochondria (M) and cytoplasm is almost devoid of background. (B) Small vesicles (V) in the basal cytoplasm are located close to the basolateral plasma membrane. BM, basement membrane. Magnification: ×35,000 in A and ×63,000 in B. Double labeling electron microscope immunocytochemistry for RBP (mouse monoclonal anti-RBP and 5 nm gold) and cathepsin D (polyclonal anti-cathepsin D and 10 nm gold) on cryosections from human kidney. Two lysosomes (L) in the basal part of a proximal tubule cell labeled for cathepsin D (arrows) are also intensely labeled for RBP (arrowheads). A cytoplasmic body (CB) is labeled exclusively for RBP (arrowheads). Inset. Lysosome (L) intensely labeled for cathepsin D (arrows) and RBP (arrowheads). Magnification, ×86,000. Double labeling electron microscope immunocytochemistry for RBP (polyclonal anti-RBP and 5 nm gold) and LAMP2 (rat monoclonal anti-LAMP2 and 10 nm gold) on cryosection (A) or sections from cryosubstituted tissue (inset to A) from wild-type mouse proximal tubules. Panel A and inset to A show lysosomes labeled for LAMP2 (arrows) and RBP (arrowheads). (B and C) Small cytoplasmic bodies located in the basal part of the cell and often close to the plasma membrane are labeled exclusively for RBP (arrowheads). Magnification: ×86,000 in A, B, and C; ×63,000 in inset to A.
Electron microscope immunocytochemistry for RBP on rat proximal tubules from cryosubstituted tissue, using polyclonal anti-RBP and 10 nm gold. (A) Labeling for RBP is seen in rough endoplasmic reticulum (arrows), in a small vesicle (V), and in a tubulovesicular structure (arrowheads). (B) Golgi apparatus (G). Labeling is observed in small Golgi vesicles (arrows). Magnification: ×86,000 in A and ×63,000 in B. The labeling of the interstitial fibroblast-like cells was confirmed at the electron microscope level. These cells exhibited a very high cytoplasmic labeling that appeared not to be confined to vacuolar structures (not shown). Analysis of the urine from four control mice and three megalin-deficient mice revealed several additional Coomassie blue-stained bands in knockout urine samples compared with controls, and Western blot analysis demonstrated that only the three megalin-deficient mice excreted RBP in the urine (Figure 7). Analysis of RBP excretion in mouse urine. Fifteen microliters of urine from mice of the indicated megalin genotypes was subjected to 4 to 15% nonreducing sodium dodecyl sulfate-polyacrylamide gel electrophoresis and staining with Coomassie blue (lanes 1 through 7). Duplicate samples (lanes 8 to 14) were transferred to nitrocellulose filters and incubated with 5 μg/ml rabbit antihuman RBP antibody. Bound IgG was detected with the enhanced chemiluminescence system (ECL; Amersham). The position of migration of molecular weight marker proteins in the gel is indicated. This observation (Figure 7) strongly suggests that megalin is important for reabsorption of RBP from the glomerular filtrate. If the excreted RBP was in the ligand-bound form it would also suggest that absence of megalin causes loss of vitamin A in the urine. To test this, we analyzed the urine for the presence of retinol by HPLC. Retinol was detected in the urine from the megalin-deficient mice at an estimated concentration of 0.2 to 0.4 μM, whereas retinol was not detectable in the urine from normal mice (Figure 8). HPLC analysis of urine from megalin knockout mouse. Urine samples from megalin knockout and control mice were collected, and 40 μl was injected into the HPLC system. The samples were extracted on-line on a solid-phase column and chromatographed on a C18 Bondapak column. The separated substances were detected with an ultraviolet detector at 326 nm. 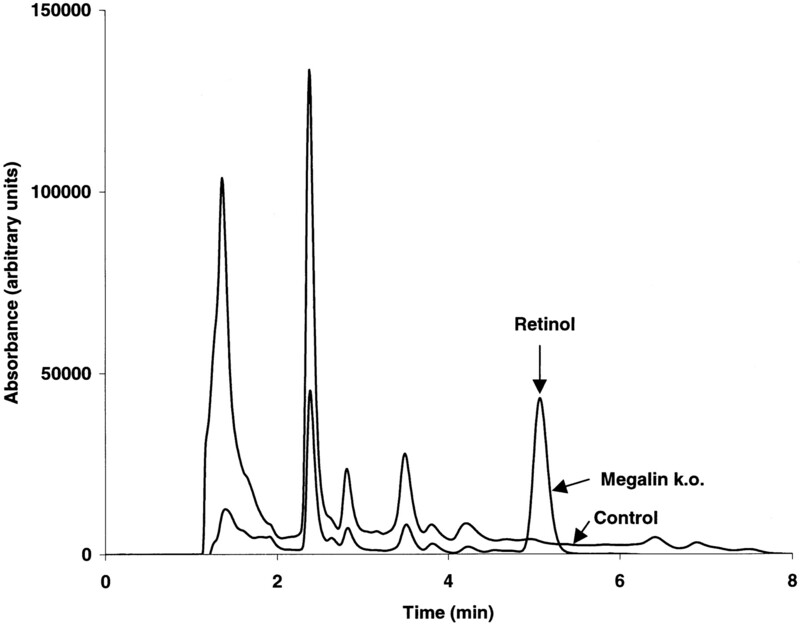 Identification of the retinol peak was done by mixing urine from a control animal with retinol standard and subsequent chromatography with identical conditions as with urine from megalin knockout mouse. Surface plasmon resonance analysis was used for investigation of the binding of purified RBP to megalin (Figure 9). The analysis revealed that RBP binds to megalin, although the interaction of the purified ligand and receptor has a relatively low affinity (1 μM at 20°C). The mass equivalent response units generated by RBP were 10 times less than that of RAP. This is probably due to the difference in mass of RBP (21 kD) compared with recombinant RAP (37 kD), and the high number of RAP binding sites in megalin rather than difference in affinity. When RAP was bound before binding to RBP, no significant binding to RBP could be measured. 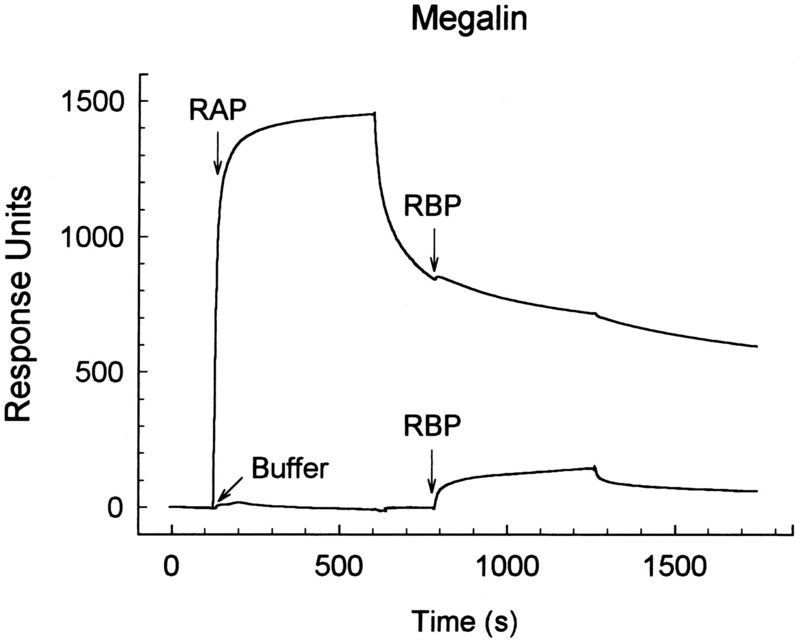 SPR sensorgram of the binding of RBP to megalin and megalin-receptor-associated protein (RAP) complex. The upper curve shows the binding of RAP (40 μg/ml). After dissociation of the loosely bound RAP (approximately 50% of total bound), RBP (10 μg/ml) was exposed to the sensor chip. Only a weak increase in response is seen compared with the response by exposure of RBP to the same megalin chip without prior binding of RAP (lower curve). The curves and values displayed represent the response after subtraction of nonspecific binding, which was measured to a megalin-chip inactivated by reduction. Endocytosis of 125I-RBP was studied (Figure 10) in a rat yolk sac epithelial cell line that exhibits a high expression of megalin. 125I-labeled RBP was effectively taken up, and radioactive degradation products appeared in the medium increasing with time. 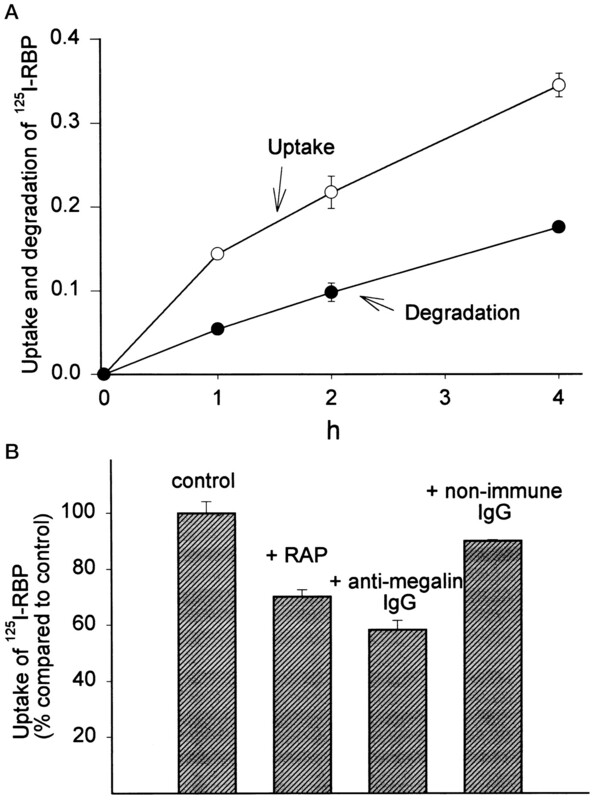 The uptake was partially inhibited by RAP and a polyclonal antibody raised against megalin (Figure 10), whereas no significant effect was seen with a nonimmune antibody. Uptake and degradation of 125I-RBP in the rat yolk sac carcinoma cell line Brown Norway/mouse sarcoma virus. (A) Time course for the uptake (○) and degradation ([UNK]). Ordinate, fraction of added 125I-RBP. (B) The inhibitory effect on uptake by RAP (1 μM), sheep anti-rat megalin IgG (100 μg/ml), and sheep nonimmune IgG (100 μg/ml) after incubation for 2 h. Confluent cell layers in 24-well plates were incubated with 125I-RBP in 400 μl of minimum essential medium and 0.1% bovine serum albumin. Degradation was measured as the increase in TCA-soluble radioactivity in the medium. Uptake was measured as the cell-associated radioactivity plus the degraded fraction. The present study reveals that megalin is a receptor for tubular reabsorption of RBP. Since 85 to 90% of the circulating RBP is saturated with retinol (29), megalin-mediated uptake of RBP therefore prevents urinary loss of retinol under physiologic conditions. Furthermore, the results suggest that RBP is degraded in lysosomes subsequent to the endocytic uptake. Retinol may then be coupled to newly synthesized RBP, which carry the vitamin back to the circulation. RBP is a widely used marker for proteinuria of proximal tubular origin (30), confirming that this protein is normally reabsorbed in this part of the nephron subsequent to glomerular filtration. Endogenous RBP reabsorbed from the tubular fluid has also been identified in proximal tubules by immunohistochemistry in human kidneys (6) and in rat (5). We found no labeling of segment 3 in rat and mouse in agreement with the findings of Kato et al. (5). However, in two of the human kidneys studied, there was a significant labeling of segments 3 in the outer medulla. These differences in the segmental distribution of RBP might be due to differences in vitamin A intake between individuals and thereby the amounts of RBP presented to the proximal tubule. The subcellular pattern of immunolabeling for RBP in the proximal tubule in all three species studied, i.e., the apparent cytoplasmic labeling, is quite different from other endogenous proteins reabsorbed in the proximal tubule, including, e.g., β2-glycoprotein-I (15) or albumin (E. I. Christensen, unpublished observations), which probably reflects that these proteins are not synthesized in the epithelium. The localization of RBP in rough endoplasmic reticulum, Golgi, and basal nonlysosomal granules often located close to the basolateral plasma membrane strongly suggests a cellular synthesis and basal secretion of RBP. Northern blot analysis has demonstrated RBP mRNA in the kidney at a level of 5 to 10% of that of the liver (31), and synthesis of RBP in proximal tubule is also suggested from studies by Makover et al. (9), although these authors found RBP mRNA preferentially in segment 3 by in situ hybridization. Furthermore, recent studies by Moskaug (unpublished data) on cultured kidney cell lines LLCPK1 and MDCK II have shown synthesis and secretion of substantial amounts of RBP. The MDCK II cells were found to secrete RBP with bound retinol preferentially to the basolateral side when cells were grown on permeable support. Since the kidney appears to be a major source of recirculating RBP-retinol complexes and since reabsorbed RBP has probably been degraded in the lysosomes (Figures 3,4,5 and Figure 10), it seems most likely that the released retinol is being coupled to newly synthesized RBP in the same cells. Actually, previous studies have suggested the same mechanism for transcellular transport of retinol in the yolk sac of rodents (32,33,34), which bear strong similarities to proximal tubular epithelium, including a high expression of megalin (35,36). It is clear from the results shown in Figure 8 that the lack of megalin in the proximal tubule causes loss of substantial amounts of retinol. A similar lack of megalin in yolk sac could in part be responsible for the observed embryonic defects of the megalin knockout mice (24). Thus, retinoic acid deficiency in embryos induced by inhibition of yolk sac synthesis of RBP also induces embryonic defects such as malformations of vitelline vessels, the cranial neural tube, and the eye (33). The lack of RBP staining in the proximal tubules of megalin knockouts further suggests that retinol itself is essential for the induction of RBP synthesis in these cells, as also suggested by the observation that treatment of F9 embryonal carcinoma cells with retinoic acid induces differentiation into embryoid bodies and synthesis and secretion of RBP and TTR (37), although this seems not to be the case in yolk sac (38) or in liver (39). In this context, it is also noteworthy that retinol induces a high increase in megalin expression and megalin-mRNA in F9 cells, as well as in a rat kidney proximal tubule cell line and in JEG-3 cells (10). Although RAP virtually abolished binding of RBP to megalin in the surface plasmon resonance analysis experiments, there was only partial inhibition of RBP internalization with RAP and antimegalin antibodies in Brown Norway/mouse sarcoma virus cells. These cells (41) originate from yolk sac, and the RBP-receptor p63, originally described in the retinal pigment epithelium (42), was recently found in mouse yolk sac (34). This receptor therefore may in part be responsible for the RBP uptake in the Brown Norway/mouse sarcoma virus cells. We have shown previously that megalin is responsible for the tubular reabsorption of transcobalamin-B12 (23) and for vitamin D binding protein (A. Nykjær, D. Dragun, D. Walther et al., Cell 1999, in press). Together with the results of the present article, these findings not only illustrate the importance of megalin as a general endocytic receptor for protein in the proximal tubule (21), but also emphasize a multifaceted role of megalin in retaining and capturing vital substances from the tubular fluid after glomerular filtration. This work was supported by grants from the Danish Medical Research Council, the Novo Nordic Foundation, the Danish Biotechnology Program, and University of Aarhus Research Foundation. The authors thank Hanne Sidelmann and Inger Blenker Kristoffersen for excellent technical assistance.